The two broody Buckeye hens have nests of their own.This pen in the chicken coop was originally designed for brooding chicks, and it has worked very well,with rafters above for hanging heat lamps, solid walls to ward off cold drafts and a welded wire top for protection. It is also an ideal location for setting eggs. The hens are secure from predation and undisturbed by other Buckeyes. Thier proximity to the barnyard is convenient since duck eggs should be misted daily when under chickens to maintain the higher humidity needs of developing ducklings. As for the rest of the Buckeyes, they are day ranging through the yard and fallow gardens. Once springtime yard clean up begins, the avid foragers (read, scratching, digging birds) will start their pasture rotations behind electronet or in the chicken tractor. 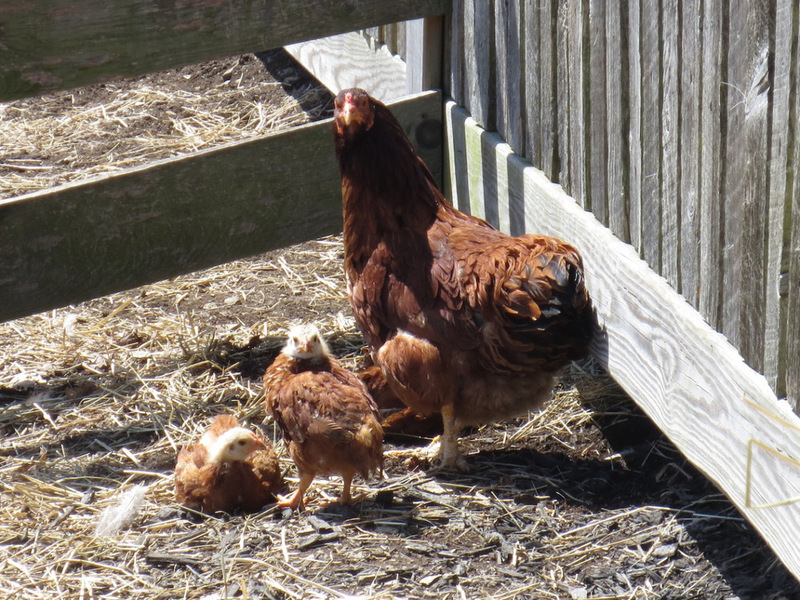 The four winter hatched chicks and their mother hen roam the yard as well. They tend to stay away from the other Buckeyes, except at night in the coop, and patrol the garden and asparagus bed.